North Georgia – The holidays are almost here, and that means family gatherings and holiday parties where people tend to be in close personal contact. Don’t bring flu to the festivities. 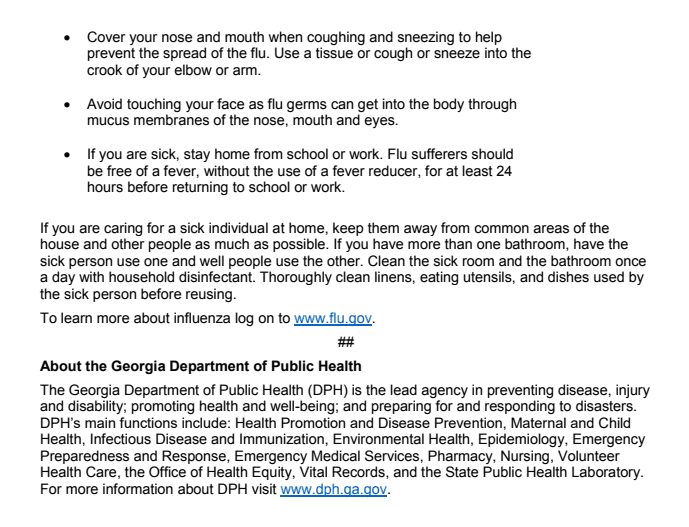 National Influenza Vaccination Week is December 3-9, and the Georgia Department of Public Health (DPH) encourages all Georgians to get their flu vaccine. The flu shot is the best protection against the flu. Influenza can be a serious disease that leads to hospitalization and sometimes death. On average, more than 200,000 people in the United States are hospitalized each year for illnesses associated with seasonal influenza virus infections. Regardless of race, age, gender or ethnicity, anyone can get sick from the flu. Those especially at risk are adults 65 years of age and older, children younger than 5, pregnant women, people with certain chronic diseases such as asthma, diabetes, heart disease or other long-term medical conditions. Preventive actions such as simply washing hands and covering the nose and mouth when sneezing or coughing can guard against the flu. 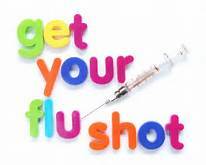 The Centers for Disease Control and Prevention (CDC) recommends everyone 6 months and older receive a flu vaccine. Getting a flu vaccine is more convenient than ever. Public health departments in Cherokee, Fannin, Gilmer, Murray, Pickens and Whitfield Counties have flu vaccine for people of all ages, including pediatric and quadrivalent vaccine as well as Fluzone High Dose for people 65 years old and older. Log onto nghd.org to find these North Georgia Health District county health departments’ contact information by clicking the LOCATIONS tab at top of the home page. Many physicians, pharmacies, employers, schools, colleges and universities also offer flu vaccines. CDC’s Advisory Committee on Immunization Practices (ACIP) recommends that live attenuated influenza vaccine (LAIV), also known as the “nasal spray” flu vaccine, should not be used during the 2017-2018 flu season. National Influenza Vaccination Week emphasizes the importance of receiving an annual flu vaccination. Even healthy children and adults can get very sick from the flu. So be wise and get immunized against the flu. 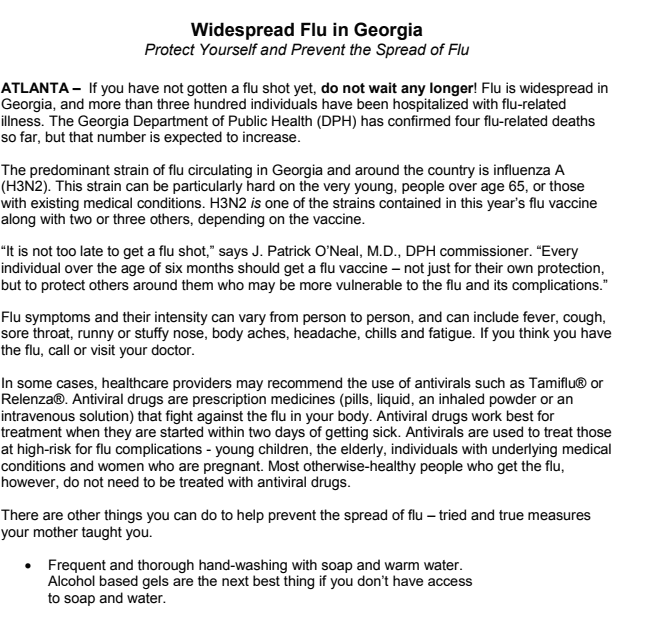 For more information on immunization, visit http://dph.georgia.gov/influenza-what-you-need-know.